C1: I’d fall asleep if I tried to finish the whole game. C2: You fall asleep from the little bottles hidden in your desk. Me: So… did Luke tell you about the Strawberries you got for your birthday? Jordan: You mean the strawberries that you opened and ate? Me: Yes. But did he explain that we were worried that they would go bad and did he show you that we bought replacements strawberries? Me: I have a question about apostrophes. Cristi: Yay! I love talking punctuation! Becky: I thought about you the other day while I was reading something Jesus said in the bible. Becky: Yes. I realized that Jesus was really sarcastic too. On Ash Wednesday, went to church during lunch. When we got there, Becky ran to the ladies room before the service started. When she got back to the pew she whispered “I think I just peed on my skirt a little.” Trying not to giggle in church is hard. When we came back to the parking deck, I got a sweet parking spot. So sweet that as I was parking someone rolled down their window to yell “You should buy a lottery ticket!” I couldn’t see out of my side window so I as I was backing in, I used the car to my left as a judge. As I got out of the car I realized that I had 3 feet on the other side of my car. Becky and I were joking about the notes I might find when I got back to the car. So… instead of re-parking, I found a piece of paper and a marker and left a note on my own windshield saying “I KNOW. 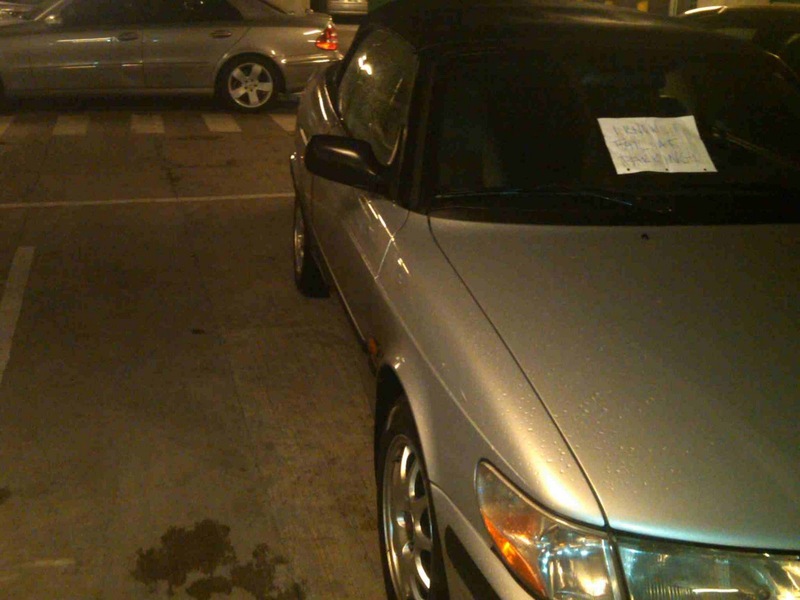 I FAIL AT PARKING.” Unfortunately, while I thought this was hilarious… at 5, I remembered I was driving my boss home from work so I had to tell her the whole story on our way to car. I guess now she knows me a lil better than she did before. Luke: Oh! Pam gave me mail for you... but I don't remember where I put--I mean Pam created a SCAVENGER HUNT for you! Me: I found it! What do I get!? Luke: 2 Pieces of MAIL! Jordan: Last week, my 15 year old son wanted to go to NY to go the Met, Guggenheim, MOMA and the Opera. This week my 22 year old son is taking me on a Disney Cruise. Nate: Are you guys upset that we weren’t taken to Disney? Me: Well, Luke just got back from NY so he doesn’t have any reason to complain. Nate: Alright, but you’re upset that we’re the only kids not being taken on vacation right? Helped Becky and her church lady friends make sandwiches and care packages for the homeless on Friday night. Nothing makes me want to show my true sarcastic jokester self like two sweet and kind women trying to make the world a better place. I showed up baring chewy bars and bottles of wine—a little something for the homeless a little something for me. Didn’t Jesus like to chase his biting sarcasm with a glass of vino? Me (coming down the stairs): Hey Beethoven. Luke: Oh yea. Did I wake you? I’m sorry. Luke: Yea. Is it bad that I kinda did it on purpose? Luke: I just wanted the company. Super Helpful Safeway Starbuck Lady: It actually needs skin touching the buttons. Me: That’s really not good news for Germaphobes. SSL: You could use the pen! Me: No people have touched that too. Me: It’s alright. It’s fine. I can do this. I’m not a mental patient or anything about it. SSL (uncomfortable laughter): Well that’s good. I drove Luke and his band-mates to a gig on Saturday night with the help of Becky. The whole evening was so funny I’m having hard time figuring out where to begin or how much I should say. Me: I didn’t know what Ska was—I love ska! Luke: I know you do, Tiffany. You know, how when you are with teenagers, the less you talk the cooler you are? Ya. I stopped being cool. 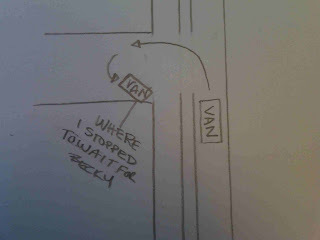 Becky’s thinks it’s when I made fun of their van packing skills while mocking them for leaving their pedals at the house. I told her I think it was back in October when I yelled at them for the tappy tap on the mic and then told them to stop the tom foolery in the pool b/c I said so and I had a flashlight. Totally worth it. 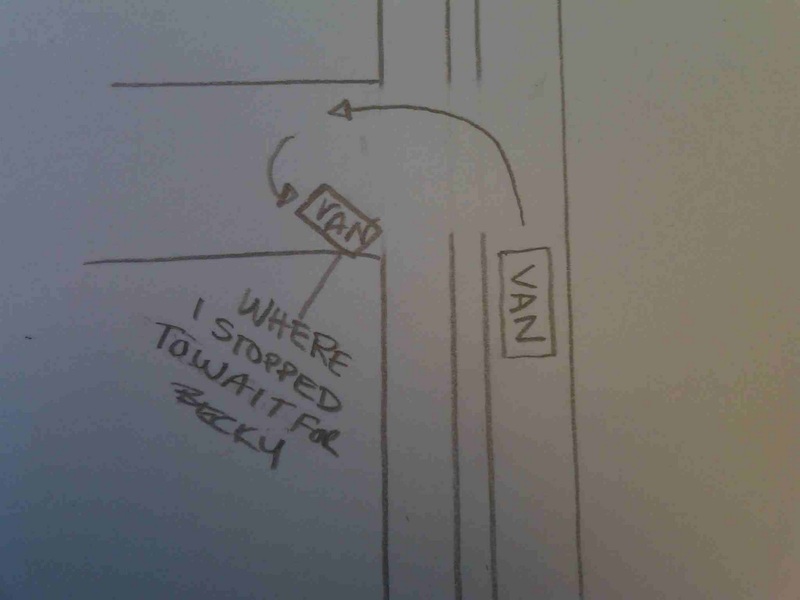 Becky: If you are ever in a situation in which you are lost and the only help you have is a 15 year old in the car---NEVER ask the 15 year old for directions. First, I don’t know why Nate is embarrassed to drive the Van b/c frankly I think the van has gone way past the point of being lame and has entered into a hilarious joke that can be told in 4 words “I’m in the van.” The car often has battery problems so the TV’s have been ripped out with the wires hanging about to preserve the battery life. (I once drove the car and wondered if this was done on purpose or if they were stolen and no one had noticed and I wasn’t overly concerned about the answer.) The passenger window doesn’t go up and instead is covered with plastic which is both loud and cold on the high way. The heat and air conditioning don’t really work (which was worse in the summer before someone accidently put the window down.) It has been used to haul trash, yard stuff, furniture, band equipment (obvi) and both closed and open containers of gasoline for the boats (there may have been some spillage). It has an indescribable scent to it and an inexplicable moss like substance that grows on the outside crevices. But hey, the tape deck works. When I was stopped, I looked in my rearview mirror and asked Luke “Do you think Becky’s car learned a new trick or is there a police car behind us?” And then I had to open the car door (which you would NEVER do in NY). Me: Sorry, the window doesn’t work. Cop: That’s fine. I pulled you over for several reasons. Why don’t you pull over on the grass over there. Me: Really? On the grass? Are you sure I can do that? Me: Are you sure you aren’t going to get hit? Me: Alright—If you’re sure. I’m sorry, I’m totally lost. Cop: That’s okay. Now your tabs say 2010. Is this even your car? Me (not at all surprised about the tabs): Oh. Yea. Not my car. Cop: You look like you’re going to a concert. Me: Yup. Driving some 15 year olds home from a gig. Cop: Turns out your up to date on the registration you just have the wrong sticker. Can I have your license? Cop: Where are you trying to go? Cop: Do you have an address? Cop: So you have no idea where you are headed? Me: Nope. I did have someone following me—but I guess they aren’t anymore. Cop: Okay… I’ll be right back. Cop handing me my license: How’s about you not make any more crazy U-turns when a cop is following you? Me: That sounds like a good idea. Cop: And you still don’t know where you’re going? Me: Nope. But I’m going to drive to that…. Me: YES! And follow my friend. Cop: Okay. You have a good night.